There are only 116 Member Cities of the UNESCO (United Nations Educational, Scientific and Cultural Organization) Creative Cities program – established in 2004 to promote cooperation between cities for “sustainable urban development” – and on December 11, 2015, Tucson became one of six Creative Cities in the United States, and the only one selected for Gastronomy. Tucson was selected for the region’s “rich agricultural heritage, thriving food traditions, and culinary distinctiveness.” In essence, it means that dining in Tucson offers a unique experience, one that reflects the culture of the Sonoran Desert, from the soil to the people who live here. Visit Tucson’s Communications team seized this opportunity – swiftly elevating the destination’s thriving food traditions and culinary originality on a global scale. Forty-seven articles with a publicity value of $11 million were generated in 2016, including feature stories in The New York Times and USA Today. In the first two months of 2017, four articles championing our region’s exceptional food offerings have published, with a media value calculated at $474,277. The UNESCO honor set the stage for Visit Tucson’s Marketing team to create dynamic activations and memorable interactions to connect and engage with travelers and drive more “food tourism” business into our region. In the four weeks leading up to the inaugural Oct. 6, 2016, nonstop flight on American Airlines, Visit Tucson staged a high impact, high touch campaign at New York JFK Airport to create awareness about the new air service. In cooperation with legendary New York steakhouse Bobby Van’s, Visit Tucson brought in a chef and a mixologist to give their customers a taste of Tucson. The menu and cocktails were inspired by the flavors of the Sonoran Desert, and demonstrations and food samplings were offered to passengers. 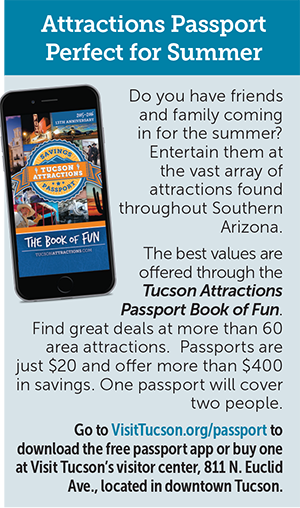 For the past two years, Visit Tucson has partnered with the Arizona Office of Tourism to showcase our region’s “hot spots” to more than 20,000 consumers annually. 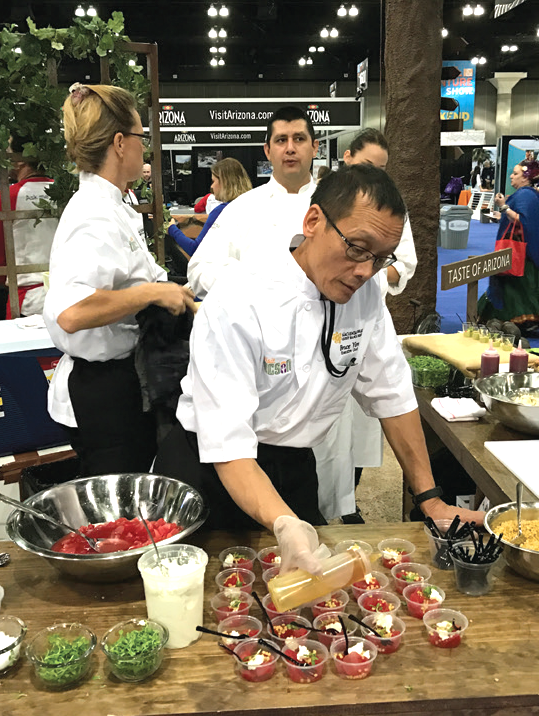 In 2016 and 2017, Tucson chefs traveled to two of our top markets – Chicago and Los Angeles – cooking up interest for the destination, interacting with media and providing travel enthusiasts food samplings and demonstrations. In the last decade, the Travel & Adventure Shows have helped more than 1.5 million consumers meet with over 3,000 travel marketers to influence $2.6 billion in travel decisions. Visit Tucson announced the UNESCO designation to 60 top travel editors and journalists at Travel Classics West, the premiere conference for travel writers and editors. 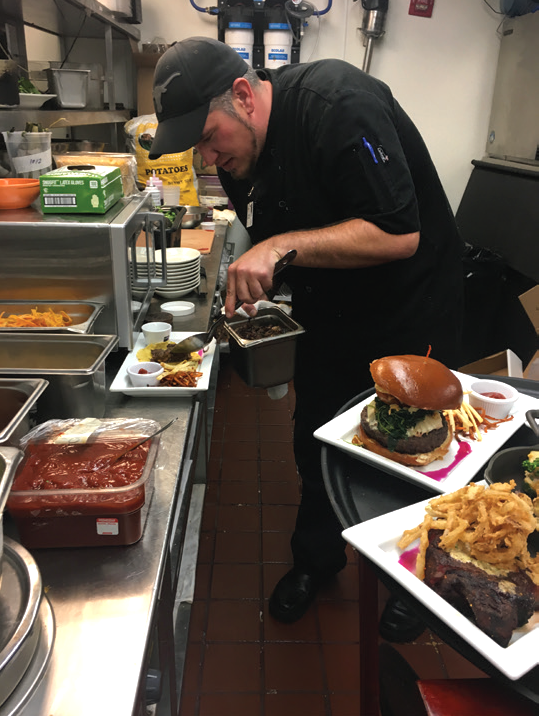 Chefs from Omni Tucson National Resort, Hacienda Del Sol Guest Ranch Resort and Casino Del Sol Resort prepared a delicious lunch with support from local purveyors. Borderlands Brewing Company and Hamilton Distillers shared the local inspiration for their beer and whiskey. 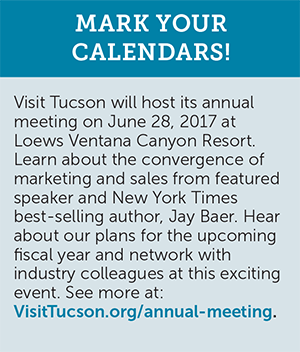 Tucson will host this prestigious conference in 2017. Sous Chef Sergio Rocha of Casino Del Sol preparing food inspired by the Sonoran Desert at JFK Airport. Chef Bruce Yim from Hacienda Del Sol serving up a taste of Tucson at the Adventure & Travel Show Los Angeles. 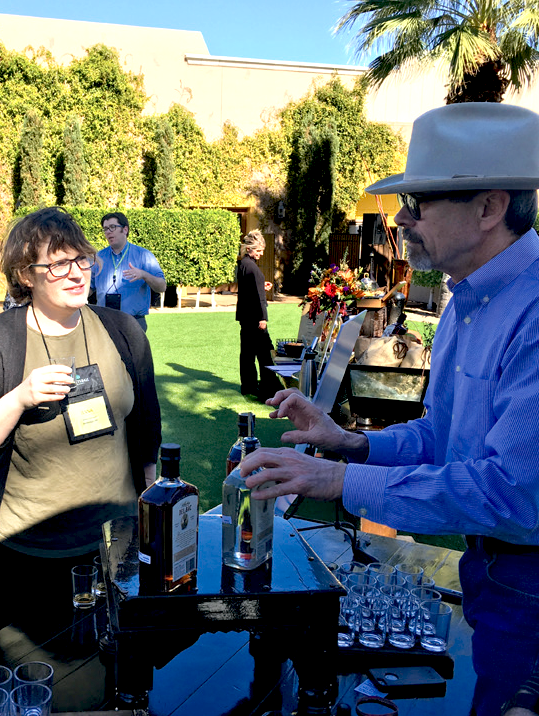 Stephen Paul of Hamilton Distillers sharing Whiskey del Bac with journalists at Travel Classics West. Gastronomy is prominent throughout the 2017 Visit Tucson Official Travel Guide, and for the first time in 30 years, food – beautifully presented by Charo Steak – donned the cover. Our feature story, “United Nations of Food” by Debbie Weingarten takes travelers on a culinary journey through Tucson.